pH Analyser for drinking water plays a major role in its treatment. The drinking water must not only meet the most versatile requirements concerning hygiene but it should also adhere conformity to certain corrosion requirements to protect the water pipes. Depending on the origin of water, the treatment process is decided to produce the drinking water of the required quality. One of the widely used process to treat the water is the open aeration of raw water. The raw water can contain disturbing, corrosive carbon dioxide, which is driven off by aeration. When the raw waters have an excess of carbon dioxide and are not in lime/carbon dioxide equilibrium, the pH value of the raw water must be increased. The water is ventilated to saturate it with oxygen and reduce solubility of the carbon dioxide. Thus, the carbon dioxide which is partially dissolved as carbonic acid when in equilibrium is driven off. This increases the pH value. The raw water typically has the pH value of approximate 6.5 which shall be increased to pH 7.5. 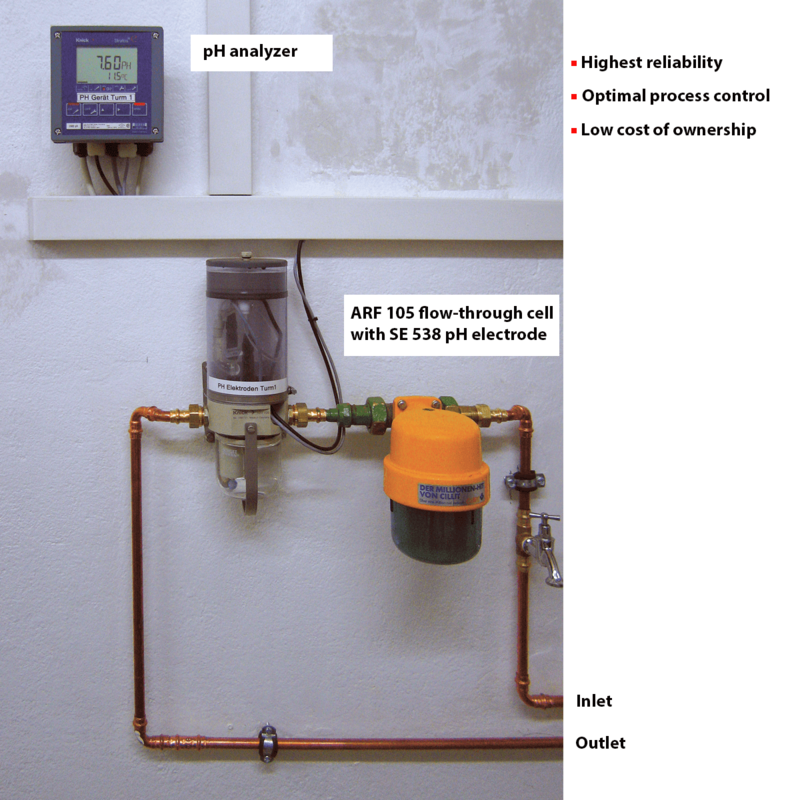 To optimize the energy input of the pumps, the pH value is continuously measured after aeration process. At each aeration tower, the aeration pumps (and thus the amount of air) are controlled via the pH value. The pH value is measured through a bypass line in the open outlet at the existing hydrostatic pressure. Depending on the number of measuring points, transmitter of the Stratos series can be used or multichannel measurements using Protos analyzers can be taken. The transparent flow cell allows easy visual inspection of the measurement and at the same time it integrates the electrolyte reservoir. Continuously introduced electrolyte ensures the required accuracy and a long service life of the electrode. Please visit our website at Process Analytics to find out the solutions we offer for analytical loops.